There are two ways to draw text in Luxor. You can use either the so-called 'toy' API or the 'pro' API. Both have their advantages and disadvantages, and, given that trying to write anything definitive about font usage on three very different operating systems is an impossibility, trial and error will eventually lead to code patterns that work for you, if not other people. The label() function also uses the Toy API. settext(text, [position]) to place the text at a position, and optionally specify horizontal and vertical alignment, rotation (in degrees counterclockwise! ), and the presence of any Pango-flavored markup. Use fontface(fontname) to choose a font, and fontsize(n) to set the font size in points. To select a font in the Pro text API, use setfont() and supply both the font name and a size. Select a font and specify the size in points. Use text() to place text. Draw the text in the string str at x/y or pt, placing the start of the string at the point. If you omit the point, it's placed at the current 0/0. In Luxor, placing text doesn't affect the current point. angle specifies the rotation of the text relative to the current x-axis. Horizontal alignment halign can be :left, :center, (also :centre) or :right. Vertical alignment valign can be :baseline, :top, :middle, or :bottom. The default alignment is :left, :baseline. This uses Cairo's Toy text API. Use settext() to place text. You can include some pseudo-HTML markup. angle  = 0, # degrees! Draw the text at pos (if omitted defaults to 0/0). If no font is specified, on macOS the default font is Times Roman. To align the text, use halign, one of "left", "center", or "right", and valign, one of "top", "center", or "bottom". angle is the rotation - in counterclockwise degrees, rather than Luxor's default clockwise (+x-axis to +y-axis) radians. On macOS, the fontname required by the Toy API's fontface() should be the PostScript name of a currently activated font. You can find this out using, for example, the FontBook application. Fonts currently activated by a Font Manager can be found and used by the Toy API but not by the Pro API (at least on my macOS computer currently). fc-list | cut -f 2 -d ":"
although typically this lists only those fonts in /System/Library/Fonts and /Library/Fonts, and not ~/Library/Fonts. In the Pro API, the default font is Times Roman (on macOS). In the Toy API, the default font is Helvetica (on macOS). 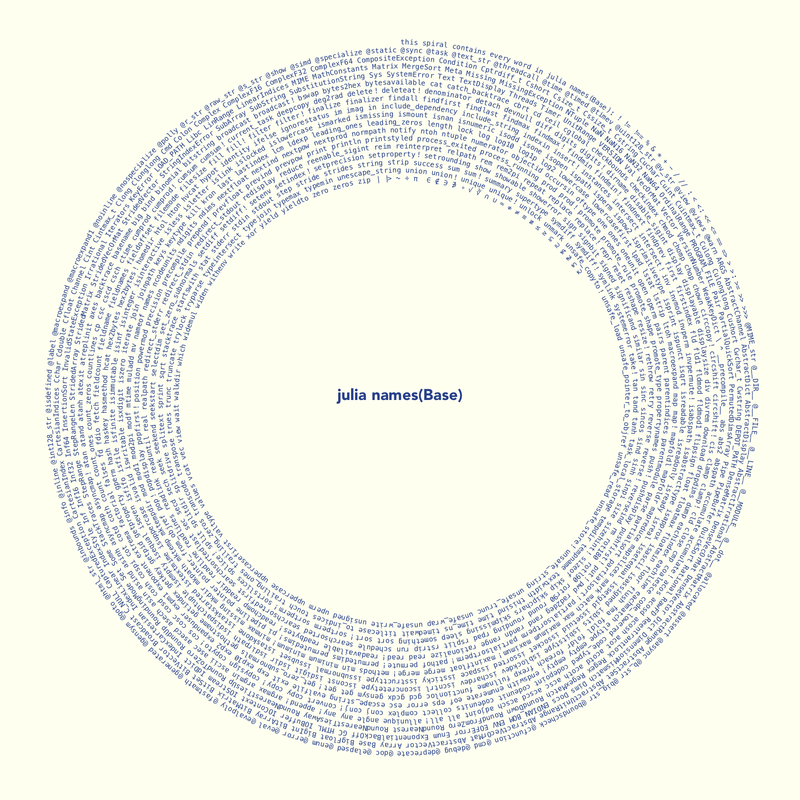 textpath() converts the text into graphic paths suitable for further manipulation. The textextents(str) function gets an array of dimensions of the string str, given the current font. The green dot is the text placement point and reference point for the font, the yellow circle shows the text block's x and y bearings, and the blue dot shows the advance point where the next character should be placed. The x and y bearings are the displacement from the reference point to the upper-left corner of the bounding box. It is often zero or a small positive value for x displacement, but can be negative x for characters like "j"; it's almost always a negative value for y displacement. The width and height then describe the size of the bounding box. The advance takes you to the suggested reference point for the next letter. 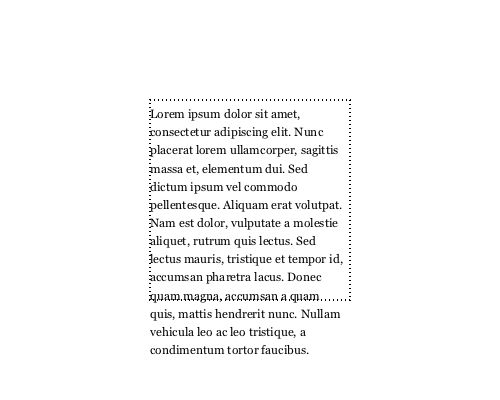 Note that bounding boxes for subsequent blocks of text can overlap if the bearing is negative, or the advance is smaller than the width would suggest. The label() function places text relative to a specific point, and you can use compass points to indicate where it should be. 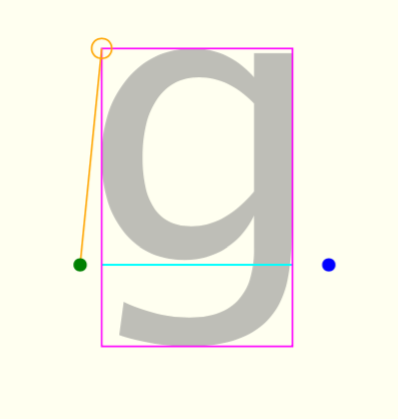 So :N (for North) places a text label directly above the point. Add a text label at a point, positioned relative to that point, for example, :N signifies North and places the text directly above that point. 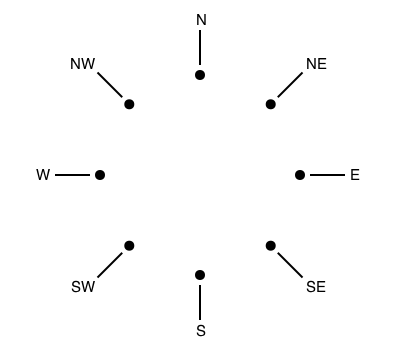 Use one of :N, :S, :E, :W, :NE, :SE, :SW, :NW to position the label relative to that point. The default offset is 5 units. If leader is true, draw a line as well. TODO: Negative offsets don't give good results. Add a text label at a point, positioned relative to that point, for example, 0.0 is East, pi is West. 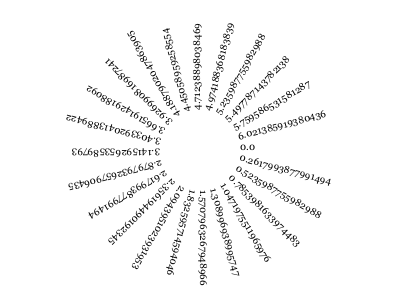 Use textcurve(str) to draw a string str on a circular arc or spiral. 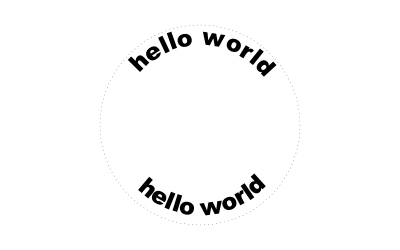 For shorter strings, textcurvecentered() tries to place the text on a circular arc by its center point. Place a string of text on a curve. It can spiral in or out. start_angle is relative to +ve x-axis, arc/circle is centered on (x_pos,y_pos) with radius start_radius. letter_spacing adjusts the tracking/space between chars, tighter is (-), looser is (+)). baselineshift moves the text up or down away from the baseline. namelist = map(x->string(x), names(Base)) # get list of function names in Base. 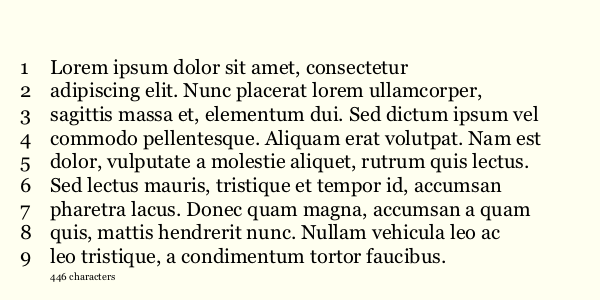 Longer lines of text can be made to wrap inside an imaginary rectangle with textwrap(). Specify the required width of the rectangle, and the location of the top left corner. dolor, vulputate a molestie aliquet, rutrum quis lectus. leo tristique, a condimentum tortor faucibus.""" textwrap() accepts a function that allows you to insert code that responds to the next line's linenumber, contents, position, and height. The textbox() function also draws text inside a box, but doesn't alter the lines, and doesn't force the text to a specific width. Supply an array of strings and the top left position. The leading argument specifies the distance between the lines, so should be set relative to the current font size (as set with fontsize()). This example counts the number of characters drawn, using a simple closure. Draw the string in s by splitting it at whitespace characters into lines, so that each line is no longer than width units. 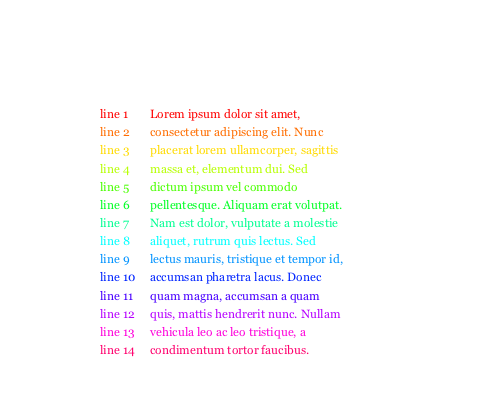 The text starts at pos such that the first line of text is drawn entirely below a line drawn horizontally through that position. Each line is aligned on the left side, below pos. If you don't supply a value for leading, the font's built-in extents are used. Draw the strings in the array lines vertically downwards. leading controls the spacing between each line (default 12), and alignment determines the horizontal alignment (default :left). Optionally, before each line, execute the function linefunc(linenumber, linetext, startpos, height). See also textwrap(), which modifies the text so that the lines fit into a specified width. Split the text in string s into an array, but keep all the separators attached to the preceding word.